We’ve introduced the ‘Hierarchies View Support for PHP‘ recently. Let’s now review the appropriate actions. First, class hierarchy. There are several actions accessible from the upper panel and context menu. Blue arrow points to the base element for current view. It is an element you invoked hierarchy on. I’ll go through the most important actions. 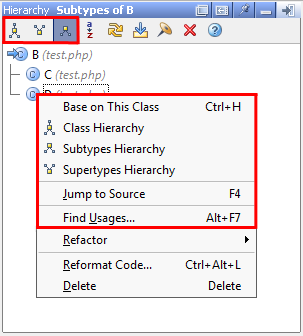 “Class Hierarchy” shows subtypes and supertypes in one tree. This is not applicable when tree base element is an interface. “Supertypes Hierarchy” — is a tree with a base element at the root, children correspond to extended classes and implemented interfaces. “Subtypes Hierarchy” — is a tree with a base element at the root, children correspond to classes (if base element is a class) or classes and interfaces (if it’s an interface) which are derived from current. “Base On This Class” changes the base element. Call hierarchy view actions differ a bit. Here you can limit shown items to a chosen scope. 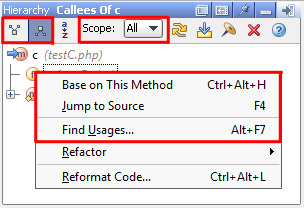 “Caller Methods Hierarchy” action shows methods which call the base function, “Callee Methods Hierarchy” shows methods which are called within the base function. Two more actions are the same in all hierarchies: “Jump to Source” brings you directly to item description in the code. “Find usages” will list all usages in the selected scope. This entry was posted in Cool Feature, PhpStorm and tagged PHP, PhpStorm. Bookmark the permalink.